A picture of Disneyland in California. 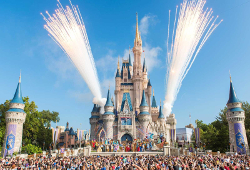 You can read about the Disney trips and vacations we offer here, zo you can have a great time at the Disney Parks. Soon there will be more destinations, like Disneyland (Anaheim, California) and the Disney Cruise line! 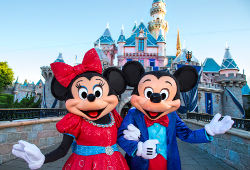 Disneyland in Californië was the first park of Disney, and it is the mental product of Walt Disney and his brother Roy Oliver Disney. Through the years it has been the most famous and most visited themeparks. After the original Disneyland became a major succes, the company decided to expand to Florida, Paris, Hong Kong and Shanghai. In total there are six parks worldwide. It’s a small world after all..!